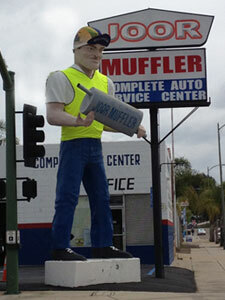 Escondido's Joor Muffler Man has been at the corner of East Valley Parkway and Juniper for 40 years. A pencil-thin moustache, blue eyes and piercing gaze give this over-sized man an imposing presence in the community. During his years of service, he has survived various pranks and has been known to dress up as Santa in December. 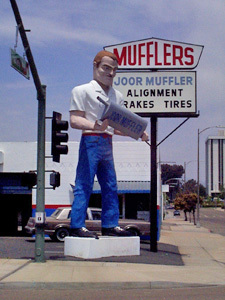 To read about other "Muffler Men across the United States," visit www.roadsideamerica.com/muffler. On Wednesday, May 8, 2013, at 10:00 a.m., the 22-foot tall Joor Muffler Man had his first (and hopefully, final) fitting of the sporty new cycling gear he will be wearing for the overall start of the AMGEN Tour of California race in Escondido on May 12, 2013. A crew from the Escondido Public Works Department, using a bucket truck, assisted in dressing the tallest man in Escondido. His outfit was designed and donated by Michael Gilstrap, owner of Walz Caps in Oceanside.